Unbelievable but true! Today Knutitours celebrates it’s 10th anniversary! When I started this tour I never thought I would be writing this. I never believed Knutitours would still be going strong after all these years. What is Knutitours? It’s impossible to answer that question with only a few words but if I try to answer in a ‘nut shell’ – Knutitours is a mixture of the real world and a very special virtual fantasy world. Our tour started in the Knuipe and a little later Knuti’s Weekly Magazine was introduced. There have been ups and downs during the long journey – from small mishaps to a total crash but like the bird Fenix Knutitours has always arised from the ashes. 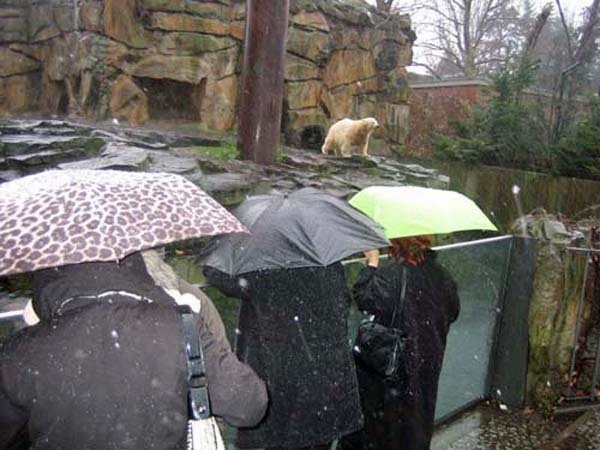 I think this photo of Knuti-Judi and me watching Knut in a pouring rain describes the journey quite well. Together with all the Knuipe bloggers and the readers of Knuti’s Weekly Magazine we have kept the motor running in spite of the very bad weather sometimes! Because everybody reading this article knows what this Magazine is about I want to share some memories of our hangout the Knuipe instead of telling the history of Knuti’s Weekly. 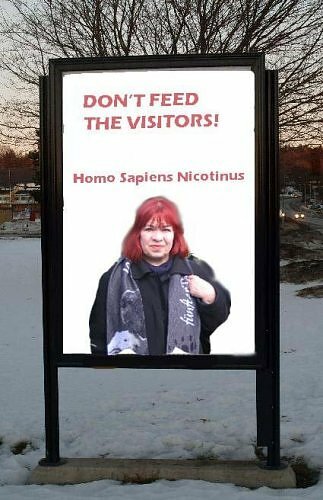 It was, of course, a crazy idea to base a Magazine on articles and reports from different zoos because I myself very seldom have a possibility to visit a zoo. However, thanks to many excellent reporters and photographers the Magazine has become what it is today. I’m truly grateful for everybody for their help! …. but now to the Knuipe! The Knuipe ‘headquarters’ is placed in Berlin so ‘Ich habe immer einen Koffer in Berlin’. 🙂 But the Knuipe can be anywhere when needed …. In 1985 I visited ‘Zur Kneipe’ in Rankestrasse 9. When I created the Knuipe I must have had the memories of that cosy Kneipe in my mind although I had forgotten my visit. 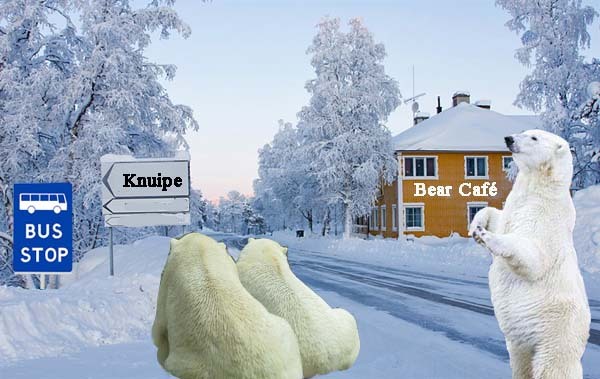 Viktor kindly made this picture of the facade and, naturally, Knut was our dear Waiter in the beginning. 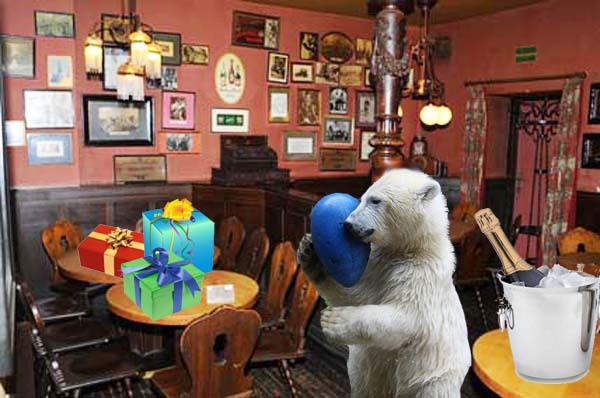 When Vesa and I attended Knut’s first birthday we even visited ‘Zur Kneipe’. What a surprise it was to see it looked just like the Knuipe I had created in my mind! Sometimes our memories are well hidden but they’re still there …. I could never have managed to keep the Knutitours going without lots of help from many talented writers, photographers and collage makers. As an example I can mention Annemarie’s morning bulletines which are already classics with lots of humour and with her never ending phantasy. 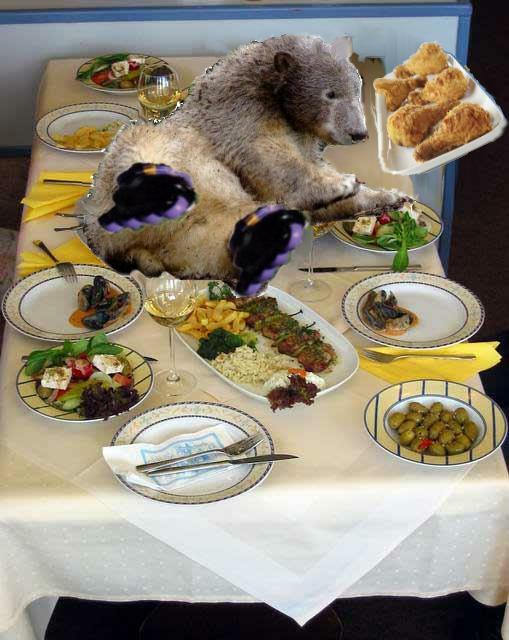 Oh bear, there were lots of mishaps with our roller skating Waiter …. but noboby could ever be angry with him. This collage was made by Bauz. 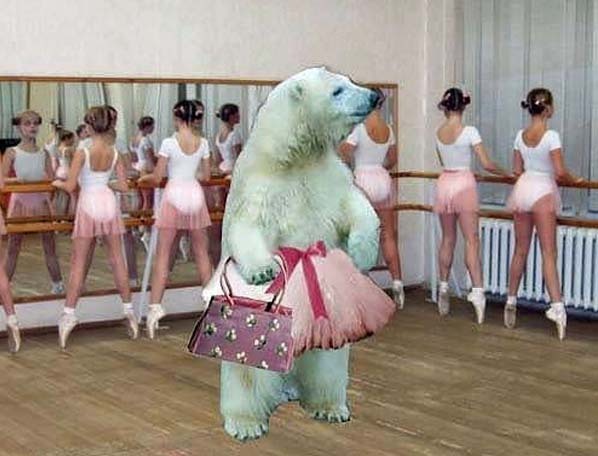 Here Fräulein Flocke wanted to take ballet lessons. There’s no doubt she was the prima ballerina and the primadonna assoluta of this ballet ensemble! When the time passed Flocke, Giovanna and Rasputin were helping our Waiter. Their speciality was to quality control all the food served in the Knuipe. They certainly took their job very seriously. 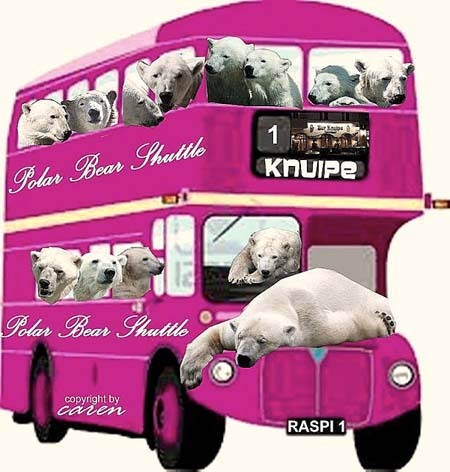 The Knuipe parties are always special occasions and every polar bear with self respect wants to attend them. So if you see this bus on the Autobahn you know where it’s heading! We have shared sad times and good times in our Knuipe. We were in deep morning when Knut – our beloved Waiter – had to leave us far too soon. At that time I was asking myself if there was any meaning in continuing but then I thought that keeping the Knutitours going was a tribute to Knut! That’s why I didn’t even change the name of Knuti’s Weekly Magazine. At the same time there were severe server problems so the Knuipe had to be placed temporarily in KWM. After the problems were solved it felt a bit sad to reopen it in the usual place without our Waiter. 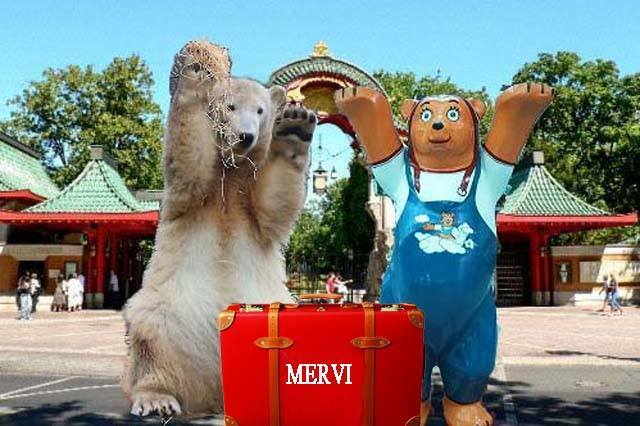 However, somebody – I think it was Caren – suggested that Yoghi and Ludwig from Hellabrunn could help us to maintain the good service. Sadly even Yoghi had to leave us far too soon but even his spirit is still with us! I can’t remember when Uncle Sergej made his entré but he came to stay! He’s Raspi’s uncle who claims he’s one of the Romanovs. Well, we may have doubts about that but our dear Serjoscha certainly has a colourful past. He’s been a cosmonaut, a secret agent, a world class ping pong player, a talented ice skater – just to mention some of his skils. Annemarie found out Uncle Sergej is married to Madama Ninotschka (we call her Nini) and they have 14 cubs who never grow older. Nini used to be the prima ballerina in the Bolshoj Theatre and she still dances for us on special occasions. 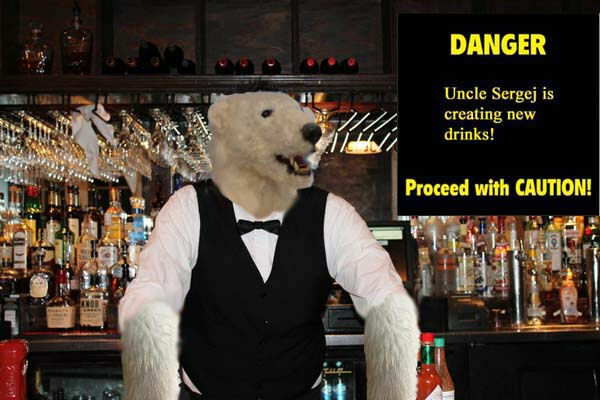 Uncle Sergej’s speciality is creating new drinks. There’s one thing common for his drinks – they all are real Micky Finns. The word ‘light’ doesn’t exist in his vocabulary. He loves to sample his creations so very often he’s ‘under influence of inventions’ to put it nicely. 🙂 Very often the good old chap entertains us playing his balalajka and singing Russian songs. As an example of the real world I want to mention the story of Tweetie. 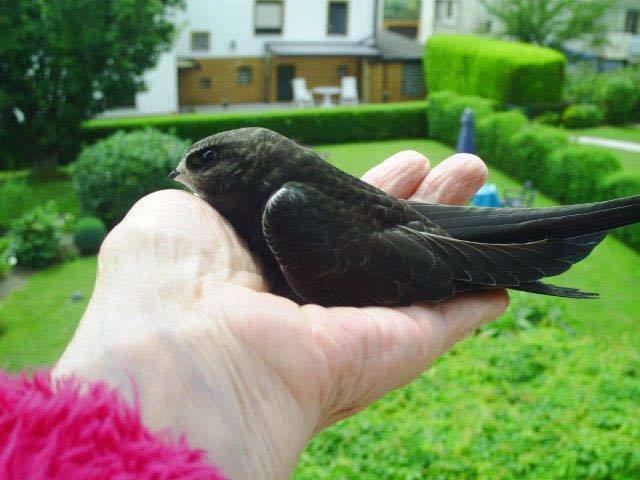 Britta-Gudrun found the little bird helpless on the ground and took care of it until it could fly away – hopefully with fellow birds. We were following daily Tweetie’s development from a ‘naked’ tiny creature to a beautiful bird. 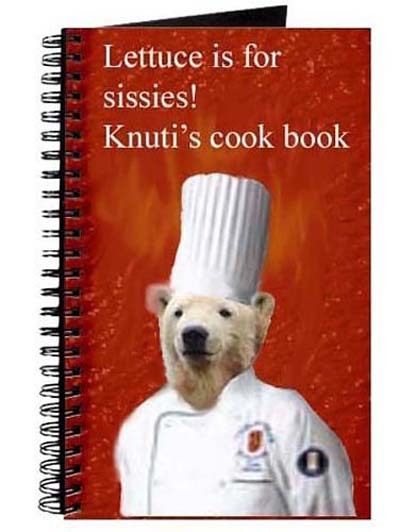 Food is a very important issue in our Knuipe so Knut wrote a cook book for us. This book doesn’t contain any green recipees! Because many of us like sports all the Championships and Olympic Games have been followed very thoroughly. During this anniversary year I’m going to publish both culinary and sporty nostalgie in this Magazine. Fiete was carrying the fire in the Olympic Games in Rio de Janeiro. In spite of the weather and slippery roads there are always visitors in the Knuipe! I want to thank all of them for being there. Some of you have left during the years , some of you have become silent readers but I’m glad there still are so many frequent visitors! The Knuipe and Knuti’s Weekly Magazine make the Knutitours. I want to think they are my humble way to connect animal lovers all over the world and I’m glad knowing that there really are readers in every corner of the world! Our magic bear is still the guiding star on our journey. Because I don’t want make our four legged friends scared the Knutitours’ fireworks are made of words and pictures – by some memories from the past ten years by Dumba, Ludmila, Patricia and Ralph! Thank you all for the 10 years! 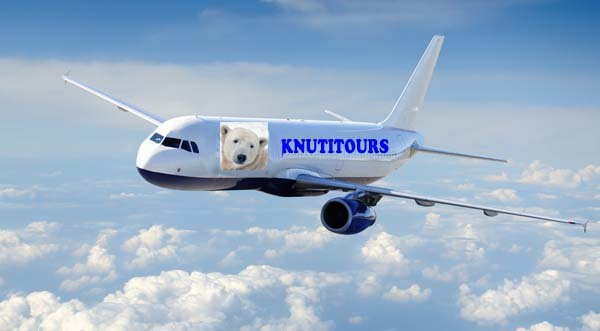 The journey goes on – welcome to fly with the Knutitours! Congratulations! 10 Years! This calls for a BIG party! The guest list is huge! So many bears to invite! And all the “regulars” will be there in our best celebratory garb! Oh, the tiaras are coming out! My long-sleeved satin gloves are on! Let us celebrate until Spring arrives, shall we? Ok, maybe not quite that long! Uncle Sergi is behind the bar popping open champagne! Knut schon tot – ich dachte, ich sehe ihn noch oft. der Zweite existiert jetzt seit Mitte 2015. Thank you for the Knutitours and for KWM. Everything started with Knut and our love to him. 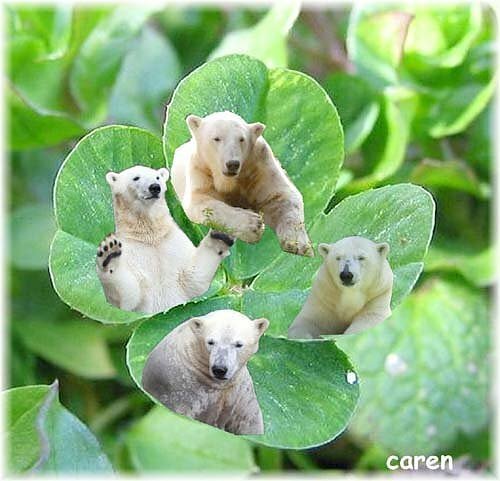 Now Knut is gone, but we are still together. 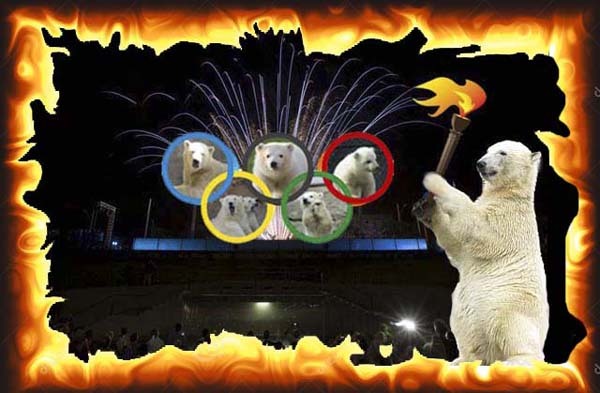 We did not forget Knut and we found many other polar bears, whom we love now. We have the good and the bad times together. I hope we will stay together in the future too. Danke fuer knutitours. So viele schöne Erinnerungen aus berlin, aber auch knut-stories zu schreiben. Es war einmal sehr kreativ Zeit. Ich wuensche, dass KWM lebt noch lange. It has been a long and exciting journey. We have lost many old friends along the way, but also made some new ones. Knut still trots beside me every day, hoping that I will hand him down a Croissant. Das erste Bild beweist den einzigartigen Charakter deines Blogs: hier stehen alle zusammen – bei Wind und Wetter in guten, traurigen und auch stürmischen Zeiten! Ein wunderbarer Ort mit interessanten Themen und Geschichten, der einen vielseitigen, respektvollen und friedlichen Austausch ermöglicht. Die vergangenen 10 Jahre sind wahrlich ein Grund zu feiern und vor allem um dir zu gratulieren und zu danken. Zu danken für deine unermüdlichen Recherchen im Internet nach Bären und Bärengeschichten in aller Welt, deine Kontakte zu vielen Zoos, die dir Informationen liefern und damit dieses Magazin enorm bereichert und zu einer seriösen und international beachteten Plattform macht. Auch heute hast du wieder eine wunderbare Chronik mit witzigen Collagen zusammengestellt, die so typisch für dich sind. Sogar unser kleiner Blog birdie Tweetie wird neben berühmten Bären erwähnt, das berührt mich sehr. Ganz besonders liebe ich deine Bildergeschichten mit den herrlichen Dialogen zwischen Mama- und ihren Babybären, mit denen du dich gut und gerne mit berühmten Kinderbuchautoren messen kannst. Mit vielen anderen hoffe ich von ganzem Herzen, dass du den Blog weiterführen wirst. Vielleicht manchmal mit weniger Beiträgen um dein Nerven zu schonen, aber mit der gleichen Leidenschaft wie in den letzten 10 Jahren! Thank you very, very, very much !!!!!!!!!!! Thank you so much for your sweet memories, the collages are lovely. I can understand you will remember of so many good visits in Berlin…. 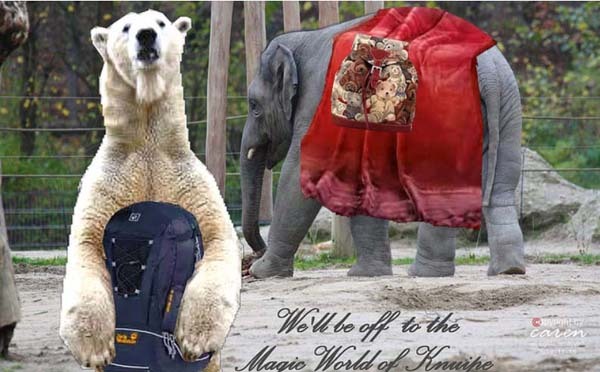 Congratulations for 10 years Knutitours and thank you for this wonderful Blog! Happy anniversary and all the best for the coming ten years! THANK YOU for all your efforts and the pleasure polar bear and animal lovers had and still have at this cosy and friendly place. This cannot be prized enough. You and all reporters, photographers and supporters who are involved in this project have done a great job! I hope you will continue! Your collages, as always, are wonderful, heartwarming, fanciful and humorous and cause lovely memories. I love them all! Herzlichen Glückwunsch zu stolzen 10 Jahren Knutitours. So viele schöne Erinnerungen der letzten 10 Jahre hast Du hier gezeigt. Dazu die wunderschönen Collagen. 10 Jahre ist eine lange Zeit. In dieser langen Zeit hast Du uns in allen Bereichen der Tierwelt immer auf dem Laufenden gehalten und sehr viel Zeit dafür investiert. Dafür möchte ich mich recht herzlich bedanken. Ich bin ja auch erst später auf Deinen schönen Blog aufmerksam geworden. Ich hatte es früher nicht so mit Blogs. Doris Webb, die ich im Zoo bei Knut kennenlernte, hatte mich damals mit Hartmuth bekannt gemacht, der ja auch einen Blog hatte. Irgendwann bin ich dort auch mit Fotos und Berichten aktiv geworden.Dann stöberte ich auch schon mal in andere Blogs. Sogar am Indischen Ozean (Knuts Aussenposten) waren wir mit unseren Beiträgen vertreten. Leider ist Hartmuth viel zu früh verstorben, und ich bin dann ins Knutitis-Forum gewechselt. Einige Mitglieder kannte ich bereits, da sie auch bei Hartmuth geschrieben haben. Und auch Knutisweekly war mir dann nicht mehr fremd, und ich bin gerne hier und schaue mir die Beiträge an, und finde es wirklich toll, dass hier auch viele Tierfreunde Berichte und Fotos von ihen Zoobesuchen und Ausflügen zeigen. Sehr schön sind auch immer die Fotos aus Orsa. Ich bin schon auf die ersten Fotos von Hope gespannt. 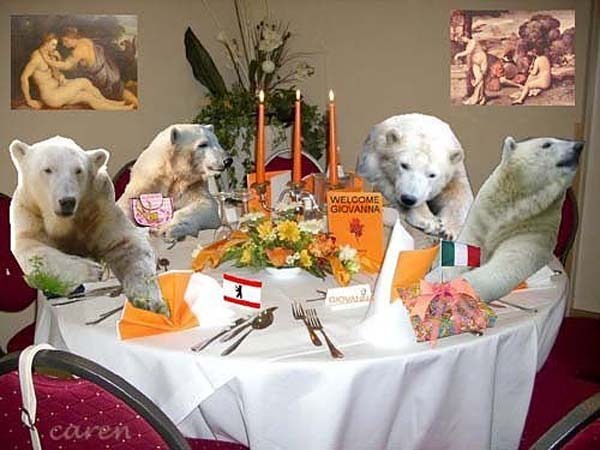 Und all das haben wir einen zauberhaften Eisbären namens Knut zu verdanken, der leider auch viel zu früh von uns gegangen st, der aber immer in unseren Herzen weiterleben wird. Ohne Knut würde es auch KWM nicht eben. 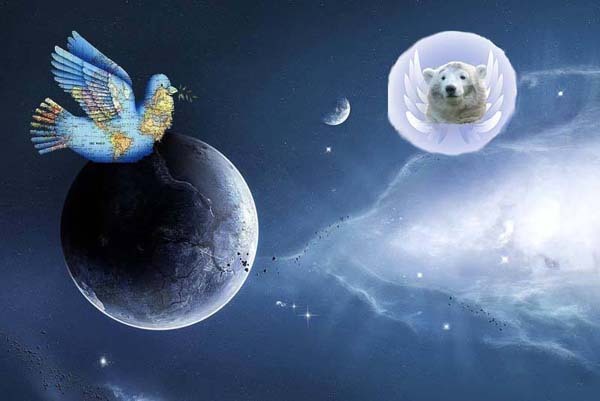 Und ohne Knut hätten wir uns wahrscheinlich nie kennengelernt. Deshalb finde ich es auch richtig, dass der Name Knutisweekly auch nach dem Tod von Knut geblieben ist. Es ist schön zu wissen, dass es viele auswärtige Knutfreunde gibt, die immer noch einen Koffer in Berlin haben. In diesem Sinne auf die nächsten 10 Jahre. Dear Mervi, I am afraid that I cannot find more or better words than the others. Therefore: THANK YOU FOR WHAT YOU HAVE CREATED. Ich bin leider erst zu Euch gestossen als unser Knut nicht mehr bei uns war. Eure Beiträge waren mir in dieser Zeit eine Erinnerung an meinen Besuch beim kleinen Knut im Mai 2008 und auch ein Trost. Seither gehört KWM zu unserem Leben dazu, wir freuen uns über die vielen Berichte von Zoos aus aller Welt, über Deine lustigen Geschichten und die wunderschönen Collagen; Dank Caren und später Ludmila konnte auch ich einige unserer Zooerlebnisse mit Euch teilen. Wir wünschen Dir und allen Bloggern und Lesern alles Gute und viele weitere spannende Jahre. Hjertelig til lykke med Knutitours og tak for dit store arbejde gennem tiden. viele Erinnerungen und Geschichten um die Knuipe und KWM. Bei mir war es der Flocke Blog der mich mit den Eisbärfans bekannt gemacht hat. Daraus sind viele Freundschaften entstanden und Caren brachte mich dann zu KWM. Nach Knuts tragischem Ableben war dann die Frage ob KWM weiter besteht. Und es ging weiter und das war auch richtig so. und Magazine im Netz bestätigen das. Danke Dir und allen die KWM spannend und interessant gestalten und auf in das nächste Jahrzehnt mit KWM! Du weißt, ich war in den letzten Tagen verreist, somit kann ich Dir erst heute eine Nachricht zukommen lassen. Ich kann nur sagen: Super gemacht Mervi! Sich in Deinem Blog zu tummeln – mit den vielfältigen und stets unterhaltsamen und oft humorvollen Beiträgen und Kommentaren von Dir und so vielen Knutfreunden – macht richtig viel Freude! Es ist sehr lieb von Dir, mich als Deine Knuipe-Mitarbeiterin zu erwähnen. Das Knut-Breakfast-Team (KBT) ist ja eine nicht mehr wegzudenkende Institution. Wie Du und auch Patricia so toll geschrieben habt, ist das KBT stets aktiv geblieben, auch wenn mal der eine oder andere Akteur sich verändert hat. Sogar nach Yoghis Tod hatten wir eine gute Lösung parat, die Du als Chefin wohlwollend unterstützt hast. Besser geht es doch nicht! Also vielen herzlichen Dank Dir und allen Knutfreunden, die bei Knutitours einchecken und sich auf eine ganz besonders schöne Reise begeben. Liebe Grüße von Annemarie und dem restlichen KBT! This is the 100% proof how you spare neither trouble nor expense when it comes to your baby/ babies ‘KNUTITOUR’, including ‘Die KNUIPE’*** and ‘KWM’ (KNUTi’s Monthly Magazine)! This mixture of skills made a success-story possible. You could give lots of proof of your writing talent, your joy of creating collages, your talent to detect useful and interesting sources of information and skilled photographers among professionals and private visitors, to keep ‘your members’ more or less in line, to loosen the reins in your blogs, as much as you are able to have things firmly under control and to put some people’s foot down once in a while (very seldom, so) when you take it for essential. You don’t tend to push yourself in the fore; however, you did always admit you have a weakness for flattery, which shows also your talent for self-irony. Attention! – here we have to be careful not to mix up ‘flattery’ with ‘honest compliments’. I am convinced most of what is said positively towards you is meant as real compliment and not as mere flattery! to maintain your blogs we are talking about with joy. Thank you very much for your present essay which is as entertaining as informative and sometimes even really touching. and in respect of the continuation of your ‘public-private’-blog-work! A hearty ‘KNUTi-style hug’ to you! 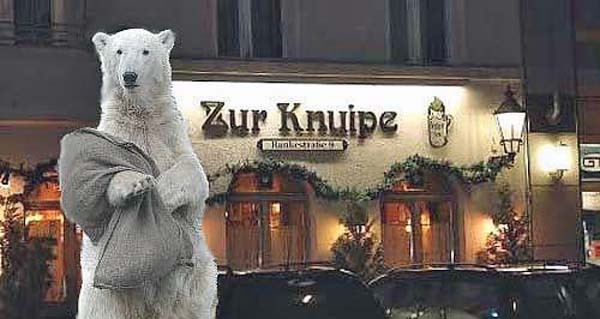 ‘ZUR KNUIPE’, a real restaurant or rather ‘public house’ in Berlin (city called also tenderly ‘CCC’ entre-nous or entre-some 😉 ) was the name giver for MERVI’s blog as she told above. The still existing cover photo for MERVI’s blog ‘Die KNUIPE’ was created an evening when some of us walked down to our at that time diner-meeting-point ‘R 23’ in Berlin’s Rankestraße at the occasion of one of KNUT’s birthday celebration days. All of a sudden I discovered this ‘restaurant’ named ‘ZUR KNEIPE’ which was on the other side of the street. I ran back to GINA (one of our so called ‘photo-aunties’ at that time of the KNUT-story, who was still behind us) and asked her to please take a pic when she will pass this restaurant. As she didn’t understand quite well (explanation: she was no active member of other than the rbb-blog!) it was VICTOR who later took the photo that’s still in use! Before this discovering of ‘ZUR KNEIPE’ in Berlin itself I wasn’t even aware that a REAL ‘Knuipe’ does exist there and that it was indeed the ‘Vorlage’ for our ‘KNUIPE’! 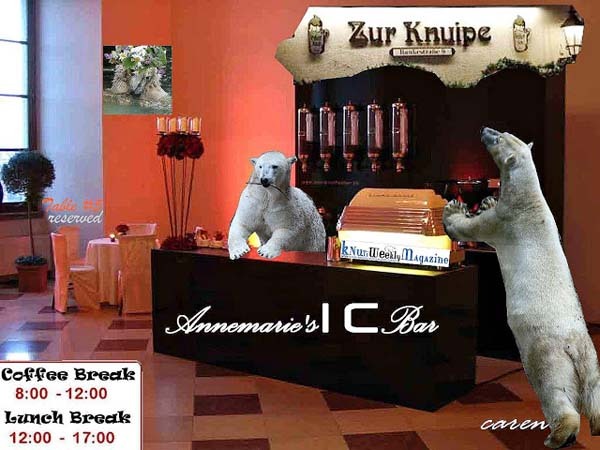 Das ist wirklich eine lange Zeit … natürlich war es Knut der uns 2007 zusammen gebracht hat. Es war eine aufregende und trotzdem schöne Zeit. Es kommen neue Jahre und immer sind die Eisbären unser Mittelpunkt. Thank you, thank you, for 10 wonderful years with Knutitours! 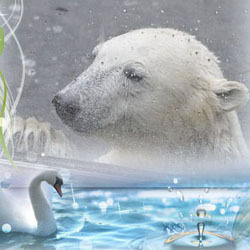 I love to learn of our polar bear and other animal friends throughout the world! Log in | 53 queries. 0.840 seconds.